A Johns Hopkins Medicine analysis of information gathered for an ongoing and federally sponsored study of aging and disability adds to evidence that a substantial majority of older adults with probable dementia in the United States have never been professionally diagnosed or are unaware they have been. A report of the findings was published in the July issue of the Journal of General Internal Medicine. Most of the findings, the researchers say, confirm previous similar estimates, but unaccompanied visits to a doctor or clinic emerged as a newly strong risk factor for lack of formal diagnosis or awareness of diagnosis. "There is a huge population out there living with dementia who don't know about it," says Halima Amjad, M.D., M.P.H., assistant professor of medicine at the Johns Hopkins University School of Medicine and the study's lead author. "The implications are potentially profound for health care planning and delivery, patient-physician communication and much more," she says. Overall, Amjad says, "If dementia is less severe and people are better able to perform day-to-day tasks independently, symptoms of cognitive loss are more likely masked, especially for patients who visit the doctor without a family member or friend who may be more aware of the patient's symptoms." An estimated 5.7 million people in the United States live with dementia, according to the Alzheimer's Association, but only half of those have a documented, official diagnosis by a physician. Timely diagnosis is important for maintaining or improving health and planning care, says Amjad, so it's important to identify which populations are less likely to be diagnosed or less likely to be aware of their diagnosis. Building on previous research, which identified activities and living conditions linked to dementia diagnosis, Amjad sought this time to pinpoint at-risk populations nationwide. To do so, Amjad and the research team drew on data from the National Health and Aging Trends Study, an ongoing study of Medicare recipients ages 65 and older across the United States, and selected those who met criteria for probable dementia in 2011 and had three years of continuous fee-for-service Medicare claims before 2011. The latter information helped the researchers determine whether participants' physicians had billed for dementia diagnosis and/or care. The research team identified 585 such adults and examined demographic data such as highest level of education attained, race/ethnicity and income, as well as data on whether participants were able to perform activities such as laundry, shopping or cooking on their own. 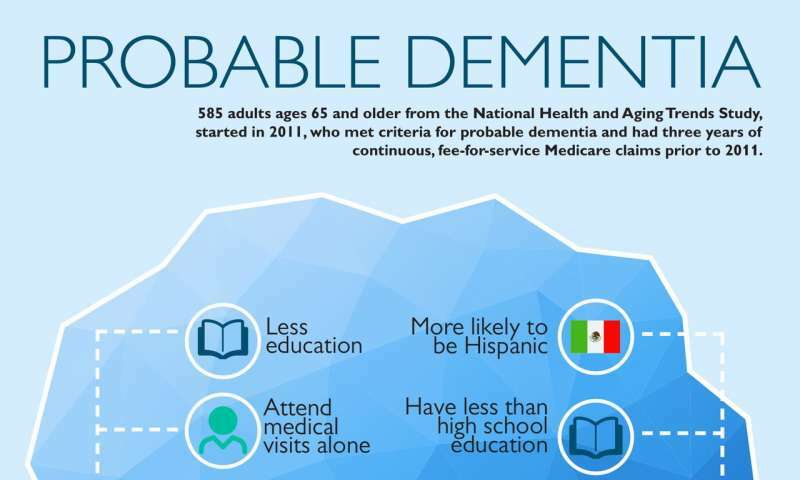 Among those with probable dementia, 58.7 percent were determined to be either undiagnosed (39.5 percent) or unaware of their diagnosis (19.2 percent). Participants who were Hispanic, had less than a high school education, attended medical visits alone or were deemed more able to perform daily tasks were more likely to be undiagnosed. Specifically, those with at least a high school education had a 46 percent lower chance of being undiagnosed compared with those who had less education; and those who attended medical visits alone were twice as likely to be undiagnosed than those who were accompanied. Participants who were diagnosed but unaware of their diagnosis had less education, attended visits alone more often and had fewer functional impairments. Those with at least a high school education had a 58 percent lower chance of being unaware compared with those who had less education. Those who attended medical visits alone were about twice as likely to be unaware than those who were accompanied. Each activity impairment decreased the chance of being unaware of diagnosis by 28 percent. While Amjad acknowledges that the study is limited by potentially inaccurate self-reporting of dementia diagnoses, possible discrepancies between medical record documentation and billing codes, and the use of older data, she says the findings will likely help physicians be more alert to people who may need more careful screening. "There are subsets of people doctors can focus on when implementing cognitive screening, such as minorities, those with lower levels of education and those who come in by themselves," says Amjad. Looking forward, Amjad plans to study whether documentation of a dementia diagnosis is meaningful if patients and family members don't understand what a diagnosis means.